This tutorial will talk about the way to resize hard disk partition on Windows Server 2008 when it says low disk space alert message. Download IM-Magic Partition Resizer Server to fix low disk space when hard disk partition is running out of disk space in Windows Server 2008. System partition C drive running out of disk space can make your PC run slowly or even crash. Data volume low disk space will disable you to store more data to the partition. Fortunately, no matter it is system partition C drive or data volume that is running on low disk space, you are able to fix the problem by resize the hard disk by relying on third-party partition magic. IM-Magic Partition Resizer Server enables you to resize hard disk on Windows 2008 and other Windows Server when there is a low disk space alert message. You should move the unallocated space close to the partition you want to extend. 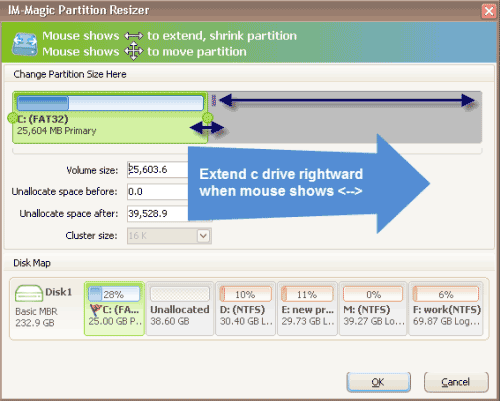 Then, right click the partition and select "Resize/Move". Extend the selected partition by adding the unallocated space and then click "Apply" button. Low disk space message: "You are running out of disk space on local disk drive. To free space on this drive by deleting old or unnecessary files, click here." When you receive message above, it means that you are running into a low disk space problem. Usually, you may encounter the following trouble when Windows Server 2008 reports low disk space alert. Although system advises you to delete files to free up space on the partition which is running on low disk space, you are quite familiar that deleting files cannot resolve the problem completely because it cannot free up a large amount of space. If you want to fix the low disk space problem thoroughly, you can use IM-Magic Partition Resizer Server. Instead of deleting unnecessary files, this partition software enables you to add free space to increase the size of disk drive without touching any data stored on the partition. The partition software can extend system partition on Windows Server, resize C drive and expand data volume as long as there is free space on other partitions on the same hard disk. On Windows Server 2008, you are able to expand disk partition size without relying on partition software because Disk Management has the function of resizing disk partition. If you want to extend a partition under Disk Management in Windows 2008, contiguous unallocated space is needed. "Shrink Volume" option under Disk Management enables you to create unallocated space, and the unallocated space will display behind the partition you shrink. If you want to move the unallocated space close to the partition you want to extend, you need to delete the partition before the unallocated space because Disk Management cannot move partition. As long as there is contiguous unallocated space behind the partition you want to extend, you can add the space to the partition you want to extend by using "Extend Volume" function under Disk Management. Many files stored on C drive are system related and very important, so you had better not delete them if you are not sure whether they are essential. Usually, if you want to free up space on C drive system partition, you can run Disk Cleanup to free up disk space on C drive by deleting temporary Internet files, cookies and caches, Recycle Bin files, and more. 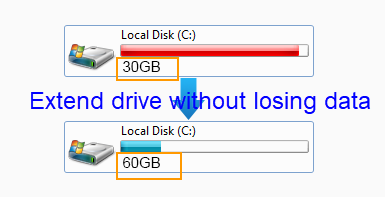 After running Disk Cleanup, you can free up some space on C drive, but it cannot fix the low disk space problem thoroughly because the space will be eaten up soon by new temporary files, cookies and caches, etc. The easiest way to free up space on a data volume is to delete files from the partition or format the partition. You can perform this operation when you consider the files stored on the volume are unnecessary. In addition, you can also run Disk Cleanup to free up space on data volume. What is more, you can delete those hidden files which are not important to you.